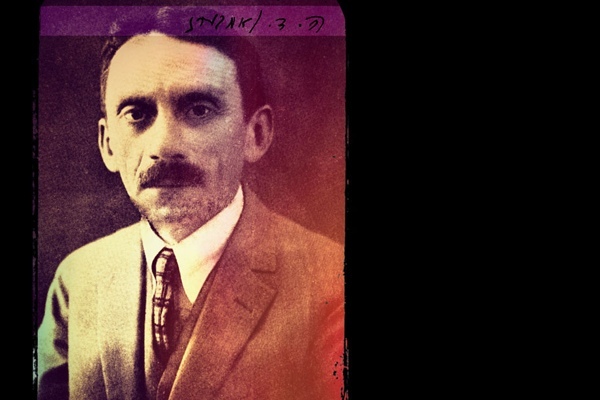 Hersh Dovid Nomberg, the Yiddish and Hebrew writer and social activist was born on April 4, 1876. Nomberg was close friends with the great Yiddish writer Y. L. Peretz, whose home in Warsaw was a center for Yiddish culture. Nomberg was a leading advocate of Yiddishism and helped to organize the Folkspartey (People’s Party) in Poland during World War One, which promoted national cultural autonomy for Jews in Eastern Europe. Nomberg was a protégé of Y.L. Peretz, who encouraged Nomberg to write. 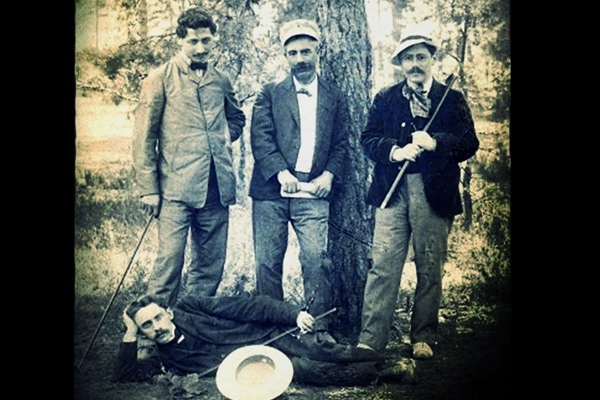 Nomberg shared an apartment with the writers Sholem Asch and Avrom Reyzen, the three became known as “The Triad.” Here are Nomberg (laying down), Asch, Peretz and Peretz's son Lucjan around 1910. Nomberg participated in the famed 1908 Yiddish language conference and proposed what became the main resolution of the conference, that Yiddish is a national language of the Jews. Nomberg helped found and headed the Jewish Writers and Journalists Association. 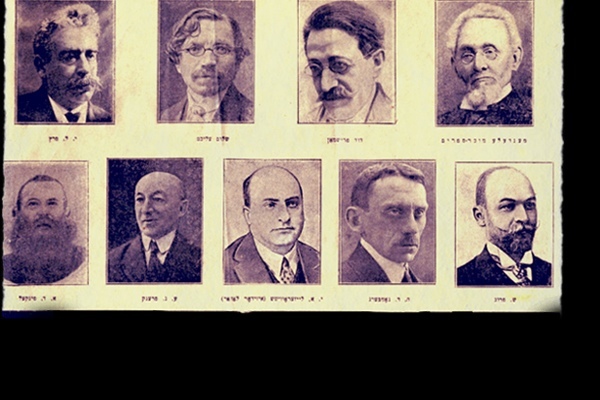 Here's Nomberg among recently deceased contributors to the major Polish Yiddish daily, Haynt. Nomberg was born in Mszczonów, Poland near Warsaw. Called Amshinov in Yiddish, it was the site of the Amshinov Hasidic court. When he was 21 years old, Nomberg moved to Warsaw to further his secular education, learning Russian, Polish and German. The exposure to European literature and to Haskola (Jewish Enlightenment) thought brought Nomberg to a breaking point with his traditional and religious upbringing. He settled in Warsaw to become a writer. Nomberg met and became a protégé of Y.L. Peretz, who encouraged and supported many of the young Jewish writers in Warsaw at the time. 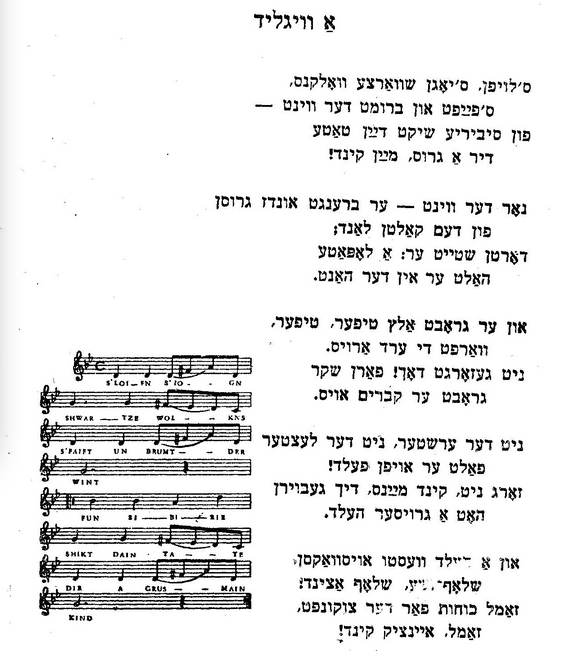 Peretz encouraged Nomberg to write in Yiddish in addition to Hebrew. His first Yiddish poem was published in 1900 and his first Hebrew story in 1901. By 1908 Nomberg had become one of the leading proponents of Yiddishism, which advocated for Yiddish as the language of the national culture of Eastern European Jews. 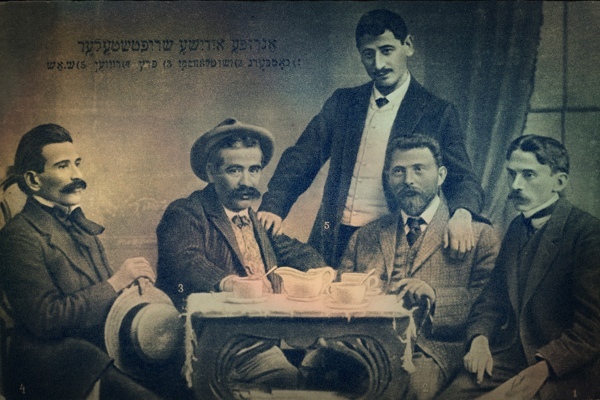 Nomberg participated in the Yiddish language conference in Czernowitz in 1908 and proposed what became the main resolution of the conference, that Yiddish is a national language of the Jews—there had been bitter fights between Yiddishists who wanted to declare Yiddish “the” national language, and Hebraists who argued that only Hebrew could be “the” national language of Jews. Nomberg’s proposal was a compromise. During World War One, Nomberg became involved in the secular Yiddish school movement and following the war made trips to Argentina and the United States to raise money for the Central Yiddish School Organization, known as TSYSHO. He also helped to found the Association of Jewish Writers and Journalists and served as the president of this organization from 1925-27. Also during World War One, he helped to found the political party Folkspartey, modeled after a similarly-named party that had been founded in Russia in 1906. The Folkspartey advocated for national cultural autonomy for Jews. Nomberg served in the Polish Sejm (Congress) for a year following the war, but then pulled back in order to have more time for writing. He died in 1927 and his funeral in Warsaw was attended by thousands.